LIVE IN CHICAGO for 1st-time! 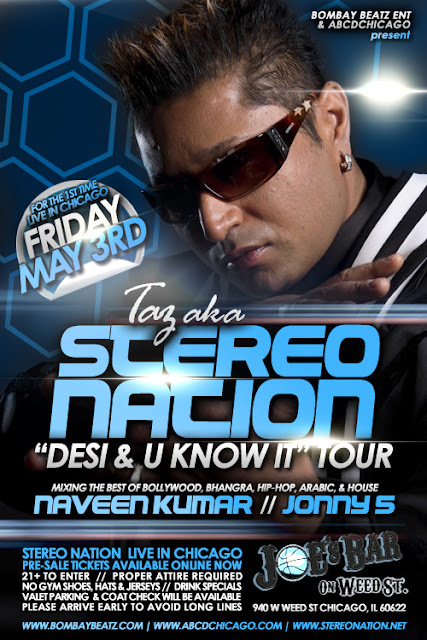 TAZ, aka Johnny Zee (Stereo Nation) a British Born Asian raised in Warwickshire UK, established himself as a recording artist with the release of his debut album ‘Hit the Deck’. He stormed the UK Asian pop charts for thirty-six weeks at number 1. The album went on to become one of the biggest selling Asian fusion releases of ALL time. Taz aka Johnny Zee received UK’s ‘Best New Artist’ for his album ‘Hit The Deck’ at the Asian Music Awards year 1989. Described as the Pioneer Of Pop Fusion, The Prince Of Crossover Music a lyricist, composer and producer, Taz quickly became the embodiment of cross-cultural music. He heralded a new era in which crossover music became the pursuit of many young British Asians.